Muda #7 - OverproductionEliminate The Muda! The last of 7 wastes (muda) to be explored is overproduction. While there may be other forms of muda that are easier to spot or more frequent, lean practitioners’ would say that overproduction is the worst form of muda. Overproduction is the worst form of muda because it is a form of muda that involves all the other forms of waste combined. I’m taking a different approach to conveying the idea of waste of overproduction. Let me know if it works! You can imagine how this all turned out. It was a bit like an episode from I Love Lucy. But before I finish the story think about the details. It all began when he didn’t take the time to educate himself properly. Out of hunger he rushed into the process of trying to make the batter. Gathering the supplies was not much different from doing it correctly with the exception of the fact that he likely carried too much to his preparation area (muda of transportation). This of course also involved more trips back and forth to the storage areas (waste of motion). The process could have never gotten so out of hand if my mother didn’t have the habit of keeping 6 months supply of food in the house (waste of inventory). We’ve already identified nearly half of the mudas and we haven’t even touched on the mixing process! Let’s look at that now. By using too much Bisquick (another waste of waste of inventory) and therefore more milk and eggs, it necessitated a lot more mixing than it should have (over processing). Put all this together and you definitely have a muda of time. But we’re not done yet. In retrospect my parents were not that tough on us. In the day however, we lived in fear. I can’t explain why, but we did. With so much batter in the largest mixing bowl we owned it still managed to fly around the kitchen as soon as he inserted the mixer. It was not until this point with batter dripping down the walls that my brother realized he’d done something wrong. He knew we (somehow he always included me when he had done something wrong) were going to be in big trouble. He stopped to review how he’d gotten himself into this mess. At this point in reviewing the instructions on the side of the box did he recognize his mistake. Not that it made sense but he was now on a mission to cover up any evidence. He couldn’t throw the batter in the trash can. He didn’t consider flushing it. He didn’t think about slowly washing it down the sink. His only thought was to cook all the batter and find someone to eat it. He called his friends from down the street and even asked them to bring over their dog! After about 20 minutes of cooking pancakes for now 6 of us he began to realize that there wasn’t enough time in the afternoon nor patience in his soul to finish cooking a gallon of batter. The remainder was carried out the back, through our yard, through the school field behind our house and into the woods to be ceremoniously dumped. Next came the challenge of cleaning up the mess, for which I earned a quick $5. We scrubbed and washed and wiped and mopped and even did a quick load of laundry to wash all the towels and his clothes. By the time we were done we were hungry again! What should have taken about 30-45 minutes we had wasted an entire afternoon. Almost like a sitcom, no sooner did we clean up the last remnant then our Mother walked in the front door. While the muda of overproduction is not as common in one’s personal life as it is in a factory or work environment it does happen. When it does happen in generally causes most if not all the other forms of waste as well. What about your life, have you ever experienced the waste of motion, transportation, inventory, over-processing, rework, time, or overproduction? I am looking for good personal stories to share. Send me an email at myblog[at]eliminatethemuda.com with your story. If I use your story in a post I will send you a $10 gift card to the store of your choice, better yet I’ll send cash! Taiichi Ohno (Credited with first identifying the 7 forms of waste) himself stated in an interview after retirement that he never said “there were only 7.” Come back next week to read about forms of waste beyond the traditional 7 forms. 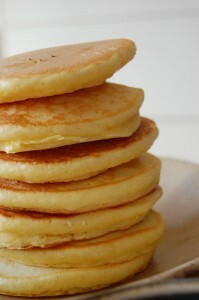 It’s easy to create your ain healthy and downy homemade Denny’s hot cakes with this easy-to-follow Denny’s flannel cake recipe with healthy ingredients, such as Whole Wheat Flour and Canola, served with a dollop of cream cheese and unadulterated maple syrup or dear , or create your ain healthy pancake toppings.